This entry was posted on Monday, February 2nd, 2009 at 01:45 and is filed under Uncategorized. You can follow any responses to this entry through the RSS 2.0 feed. You can leave a response, or trackback from your own site. I wonder if this would work on the deadbolt version of the lock with all the hardened pins and cylinder? Basically the drill bit is just a regular holesaw, except it uses braze welded carbide tips (as do many other tools such us table saws). The diameter is just the right size, meaning the same size as the inside cylinder that houses the detainer discs. In the center is probably a spring forced rod that centers the drill bit and guides it and also stops at a certain depth (just at the first disc). At least this tool (toool?) will give breaking-and-entering damage, not something like an undetectable bumping tool for some other locks. Every lock can be busted with enough force, even a Geminy Shield will not keep out an intruder with heavy equipment. The holesaw is an off-the-shelf item (see http://de.hoffmann-gmbh.de/K39/images/pdf/118400.pdf ), just the retracting pin is custom-made. Undetectable – that’s difficult to judge, after all the housing could easily be replaced around the original disks. I believe Klaus has tried this technique long ago, he just decided to market it only recently, obviously because it helps promoting the sales of strong hardware around the lock cylinder. Similar to what happened with U&Z locks and the “devil’s ring”. What worries me is that other inventors of such techniques, such as e.g. John Falle, have different motivations and do not publish their attacks, yet they are clever, too. So who knows how many Protecs have been opened before without the owner even noticing it. The only concept that helps in the long run is an “Open Source”-like approach, where the best physical security penetration testers available (I’m referring to the locksport community, of course) thoroughly test a lock that has an “open” design without secrets or obscurity. The result will of course not be indestructible, but will have a well known and documented minimum opening time and effort, that should be way more secure than what we saw in that video up there. For my situation, I would think that an ordinary burglar will not drill out my front door lock and then replace the housing of the lock. (BTW, for that the lock must be removed from the door). But, you gave me an idea, I will go and mark my lock housing to be able to detect this. One of the problems with the Geminy is that it looks ‘odd’. Thirdly, I thing that using such a class of device on a Geminy will also allow entry. Something with a center-point and tips will slice the shield and then allow access to the lock. I like the idea of an ‘Open Source” lock (I will read the http://www.theopensourcelock.org link, sounds very interesting), but I don’t know how an ‘Open Source” lock will protect from such a drill attack. Anyway, how can a lock protect longer against such drill attack? In this concept, the whole outside part of the lock can be made of strong steel, filled with hardened inserts and the like, no need to place a weak key testing mechanism there. Pieter does make a point, and I think thats something certainly to consider here too. Open source can help a lot of things but some attacks you just don’t see, and everything can always be physically attacked. This tool is certainly nothing amazing, it is simply something that speeds up the process of drilling the lock. As Pieter said someone with enough determination to probably make a tool to help split open the shield (although with all that metal one can only assume atleast some additional protection time). :/ Just spent hundreds on Abloys for my house and sheds! What should I have gone for? Assa twin / Evva 3ks? A lock cylinder that is tested to VdS B specifications has to be secure against opening after a drilling attack of 6 minutes. That attack is specified to use an electric hand drill max. 1000 W, max. 3000 min^-1 and HM or HSS drill bits with 2 – 7 mm diameter. Not applicable for the Protec, but it tells me that there are pin tumbler mechanisms on the market that should stay closed a few minutes longer. very interesting tool. but that drill would require a lot of power, i don’t know if a portable drill would work well unless you had a lot of batteries and it would be a noisy break it. The knocknlock lock is interesting, I wonder however how easy it is to record the knocks. It seems that there is not a two way connection. That would mean that a replay attack is possible. Also, it is not clear to me how the distribution is done of the numbers in the knock-key. Are the numbers shifting over the number space? Or in fixed positions for a certain lock and the rest is random? About your remark for VdS B specs: I would think that the Protec would stay closed longer to the specified items. Just using a 2-7 mm drill bit would not work. It is actually this special drill tool which allows the speedy entry. Of course, Abloy could add more metal or extra hardened pieces in the front housing. So Han, when can I order that version? Pin tumbler mechanisms typically protect until they have been drilled all the way through, i.e. you can put a lot more volume of hard material into the lock than the Protec can have in front of the disks, at least in that 30mm Euro cylinder configuration. Protec padlocks e.g. do have thick metal in front of the disks. One way transmissions can be protected reasonably well from replay attacks with large counters that will ensure that each transmission can be used only once. There is one vulnerability in a system without synchronized clocks (the KnockKey doesn’t have one) and that comes up if you program multiple locks to the same pin code – a 2nd lock will not know if the one-time-code has been already used (and maybe recorded) on the 1st lock. Abloy Finland is constantly working to improve their locks in all areas including physical attack. 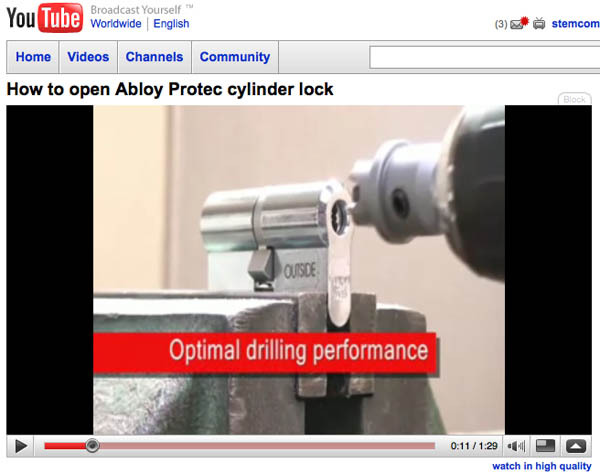 Abloy has been working the past months on a more hardened drill resistant cylinder. Within a few weeks I expect to have more details about it. I believe they will show this solution first to experts who can give an opinion about its resisting against various physical attacks (including this one). If these people are convinced that it’s ok, they will start producing this solution and then it will take at least 6 months before you can buy it is my estimation. At this moment all the Abloy Protec Euro-profile cylinders I sell have a unique engraving. It starts with “HFLT” followed by 6 numbers. I put these numbers on the securitycard. In case of doubt, people can remove the cylinder and look if the extra number on the card, matches with the number on the lock. This number has nothing to do with the actual keynumber. An example of the engraving you can find on http://www.securitysnobs.com which offers this service. Imagine that somebody should enter your premises with this drill bit and drill, he first must have bought that drill bit and beware of the fact that you have an Abloy Protec lock on your door. If he then manages to drill open your lock (with a simple pull-out protection in front of the cylinder you can already prevent this) he has the drumm with discs in his hand. OK, he can now read the discnumbers. If he then replaces the steel housing with another housing, he first has to remove the cylinder out of the door, build the cylinder together again and then the next problem comes. He needs a key to mount the lock in the door again. If he has a portable Abloy Protec keymachine with him and he has the blanks(which is why having a Ruby or Diamond key profile is good) for that specific keyway he will manage to do it. Then we have the unique engraving. This engraving is made with a dot printer. The dots this printer makes are unique (as you will see on the pictures on the security snobs website). Use of the drill and replacement will in my opinion always be visible, if you have a clear picture of the engraved numbers. An example to prevent the drill from centering is the use of a thicker front-profile plate. Just like they use in the old disklocks. The thick hardened frontplate, on the same height as the housing prevents centering of the drill. These are only a few solutions. I assume Abloy will come with a more permanent hardware solution. About the KnockNLock: Somewhere in the sparse info available on the website (under the ‘Major Benefits link) it is written that the last several hundred operations can be read out using a PC. This implies the lock keeps several hundred entries. (Duh). If I would build that system, I would read back in that buffer to check if I found a duplicate key and reject it. An other possibility, if the lock just keeps a serial number counter for each key and accepts only keyknocks that have a higher serial number, this would not occur, but the maximum number of keys will then be limited, as for each key this number must be stored. This number should not be small, otherwise it would roll over too fast. What I can not find is if the KnocKey must be programmed for a lock. They write that it can open an unlimited number of locks, so it seems it is the other way round, the lock is programmed. How many keys can be programmed into a lock? Is the Protec Cliq version already ‘interesting’ or still much too expensive? I see that the securitysnobs.com had the same idea I had when I ordered my lock with you, of having a different inside as outside key (The Emergency Key option), did you tell them? You gave me the impression you had not done (heard?) that before. I think that the problem with the codereading is another. In many objects you have cylinders with the same code. Also on vending machines. You could drill the first machine, decode the key, get the money out. Afterwards you can empty the cash of the other 49 machines which have the same key. PK is this not true for any mechanical lock? If you can drill say a medeco and remove the pins and can make a new key then you can open anything the key can open. I would say that cutting a medeco key is lifetimes easier than cutting an Abloy key on a restricted blank, (unless you have some magical Abloy abilities:)). I would almost certainly say it would be easier to just buy multiple drill bits and drill the other machines than try and duplicate an abloy key without the original key. Hi, I see all of are specialists in this branch. Recently Iâ€™ve got a catalogue of the company Mauer Locking Systems, it seems to be considerable company in central-east Europe. Anyway, from here and there I understood that they are developed one very special lock, named NW4. I saw some brief info in their website: http://www.mauerlocks-bg.com/index.php?ch=3&tr=3&id=125&lang=en. Iâ€™d like to have this in my hands, but have not seen anywhere till now. Price 10 – 20 euros each. Seem to me that this tool is no different in concept to the tubular saw I was using thirty years ago on fruit machine locks… With a bit of care the pins did not get damaged and the lock could be decoded to save having to destroy all the locks on the machine. The internal parts could be put back into another body and so reused. Do you know if this attack would word on a Abloy DisckLock / Dislock Pro ?